Trans-universal membrane penetration is a very difficult process. The only researcher who has shown verifiable, repeatable success is Professor Tyler Osteum of Brown University. Making contact to another universe requires a massive amount of energy, generated over several weeks time. As a method of exploration, it is functional, but inelegant. For multiple visits to the same location, there needs to be a better option. Fortunately, Professor Osteum's research has revealed charactaristics of the Worldspan energy field, allowing a sort of feedback effect to be generated which will help to sustain an established gateway. This reduces the energy drain considerably, provided that there is a receiving system at the destination. 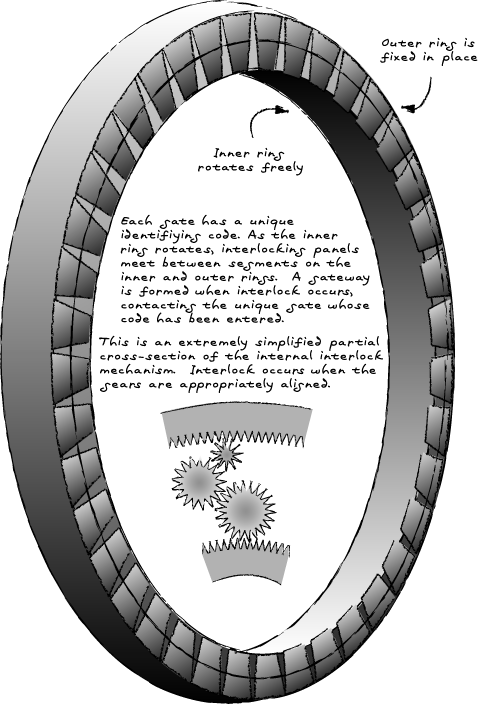 The primary transmitter/receiver in use is the ring-shaped design pictured here. This style of gateway can handle an impressive quantity of traffic, however it lacts subtlety and tends to attract a great deal of unwanted attention, both while dormant and while in use. It is highly recommended that deployment of this design be restricted to secure areas, such as the interior of established supply depots or worlds that have been 100 percent confirmed as uninhabited. Each terminal has a unique identifying code, and connecting two gates is done in a fashion similar to the operation of a patent 'Combination'-type lock. Each ring gateway is composed of a fixed outer ring and a freely rotating inner ring. 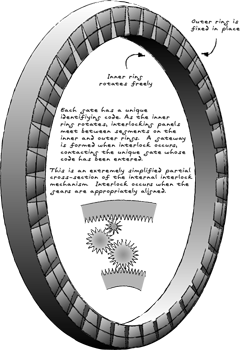 A traveller enters the code for his destination ring by rotating the inner ring in the appropriate fashion. This alters the alignment of the internal mechanisms, and establishes a gateway. In theory, over ten million gateways could be constructed, each one with an unique identifying code. In pratice, however, there are just over a thousand. This is because the gates themselves have proven troublesome to manufacture. The set-up of each gate has required the personal attention of Professor Osteum for final tuning and adjustment. It is worth noting, however, that once installed, no gate has ever required any type of maintenance, and that the gates function flawlessly even in universes with very different physical laws than our own.